I’ve often heard it said that you can’t fully understand your own parents love for you until you have a child of your own. As I’ve loved on my baby girl, Avonlea, for the past 5 months, I’ve come to realize that statement is truer than I could have ever imagined. It’s not that I didn’t believe my parents loved me before having a child. I always knew they did. They’ve shown me thousands of times through their actions, words and sacrifices. But now, more than ever before, I get it. And it’s because I’m a parent, just like them. I’ve loved someone else like they’ve loved me all along. It’s not something that you can understand in theory. It has to be experienced. And now I have. In a similar way, becoming a parent helps you better understand God. For example, before becoming a dad I missed the significance of God self-identifying himself in Scripture as “Father.” Beyond the theological meanings, he undoubtedly knew that we—people he created for relationship with himself—would understand that parent title. We all have parents. Most people will one day become parents. And “God as our Father” clearly tells us something about how he sees us. He sees us as his children. He sees us as his sons and daughters. Now that I’m a dad with a baby girl I’m starting to get it. I’m starting to understand in a new way his actions, his character and his interactions with me. He’s my perfect, heavenly father and I’m his son. Over the past 5 months I’ve had an absolute blast learning how to become a dad to my beautiful Avie Rose! There are many lessons I’ve learned and many more to come, but here are 5 things my 5-month-old daughter has taught me about God. 1. Struggling doesn’t mean God is absent. Recently Avonlea started rolling over from her back to her stomach. As she rolled over, one of her arms would always get stuck underneath her body. She would pull as hard as she could until she got it out from under her. It was quite the struggle for her. Now I could have helped her. I could have pulled her arm out as soon as she began to struggle. But I didn’t. I would get down on her level and tell her, “You can do it. Pull it out!” I don’t think she understood what I was saying to her, but she understood I was right there beside her. Often times during our struggles we get angry and think God is absent. But what if there is something to be learned in our struggles? What if growth can best come through them? Maybe God could rescue us when we are struggling, but he doesn’t. And that’s okay. He is right there with us cheering us on. 2. God wants to lead us. Avonlea is dependent on us, her parents, for just about everything. We dress her, bathe her, feed her, etc. And I know that in just a few years she will become “Miss. Independent” and think she can do life on her own. But she will still need mom and dad’s leadership because we know things she doesn’t. We have the ability to help her. In the same way we need God’s leadership. He desires to help us through life and give us wisdom for each day. He wants to help us make wise choices. He wants to keep us from the bad things of life and show us the good. But independent, know-it-all people like me, and maybe you, often miss it. We don’t think we need to surrender to his leadership. But we do. And he is willing to lead us. 3. God hurts when we hurt. I’ve empathized with others before and I really do care about people. I’ve occasionally cried when I’m sad for others. I’ve heard things on TV that make me sick and break my heart. But I’ve never truly hurt for another person like I have with Avonlea. When she hurts I hurt. Whether it’s her screaming when she gets her vaccines or her crying from bumping her head, I hurt. I feel her pain. The cross of Christ was the ultimate pain. The ultimate suffering. The ultimate hurt. We serve a God who knows what it means to hurt. He isn’t indifferent. He isn’t causing our pain. He cares. And he hurts when we hurt. 4. God wants a relationship with us. I’m so excited every time I come home because I know I’m about to see my baby girl. She smiles at me when I smile at her. She reacts when she hears my voice. She enjoys being with me. She knows me. She likes me. She can’t talk. She can’t do anything for me. But that doesn’t matter at all. I just want to be with her, because I love her. God doesn’t just want a relationship with you to save you from Hell. He doesn’t just want a relationship with you so you will honor him in your life. He wants a relationship with you because he loves you. You are one of the precious people he created. You are one of his sons or daughters. He likes you. He enjoys you. He wants to be with you. 5. God loved his son more than I’ll ever love my daughter. And I am called to love his son more than my daughter. This is by far the most difficult truth I’ve learned. At the end of the day, my love for my daughter is imperfect. It falls short. It’s selfish at times. And it’s incomplete. But God the Father’s love for his son, Jesus, is perfect. And in his love for his son, I benefited (John 3:16). Also, Jesus said we had to love our family less than him if we were to follow him. I’m realizing now more than ever how difficult that is to swallow as a dad. But what it’s revealing in me is not that loving my daughter is wrong. It’s showing that I don’t love Jesus like I need to. I don’t love him the way he deserves. He is God after all. The creator of the universe. The savior of the world. He died for me. He is the picture of true love. And he is worthy of being my greatest love. Welp, there ya go. 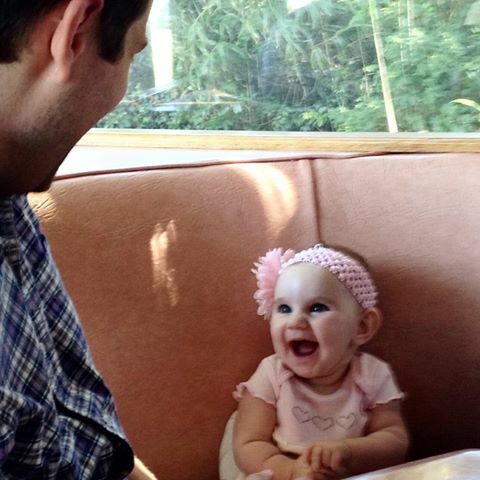 5 things my 5-month-old daughter has taught me about God. Which truth did you need to hear the most today? What would you add to this list?